TRUE PS exercise bikes combine commercial quality materials with smart design for an overall package that is unbeatable in performance and durability in the home fitness equipment market. Featuring walk-through design, the PS recumbent bike provides easy access, perfect for beginners or those recovering from an injury. These machines reduce back stress and offer simple programming, making exercise at home an easy and enjoyable process. The walk-through design on the TRUE PS50 recumbent bike accommodates users of all fitness levels. TRUE bikes are safe and allow for easier access on and off the machine. TRUE's new mesh seat is ergonomically designed for lumbar support and allows for infinite adjustment to fit every body type and relieve painful stress on the hip. The mesh material also provides excellent ventilation during exercise. TRUE's superior brake and drive system ensure a smooth motion and quiet operation that is perfect for your home gym. 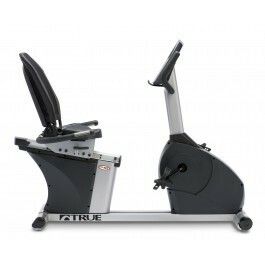 The TRUE PS50 recumbent bike combines performance and ease-of-use with TRUE quality.